Michele McLean (left) and Pat Wong (right). Courtesy photos, County of Maui. 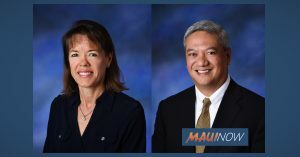 A council committee on Tuesday advanced a recommendation of Michele McLean as director of the Department of Planning, but voted down the mayor’s appointment of Pat Wong as Corporation Counsel. This is the second appointee that the committee has voted against. Last week, the council’s Governance, Ethics and Transparency Committee voted 5-4 against recommending the Mayor’s nominee, John D. Kim  as prosecuting attorney. Members of the committee took no action on Mayor Victorino’s nominations of William Spence as director of the Department of Housing and Human Concerns and David Goode as director of the Department of Public Works. The recommendation in favor of McClean now heads to the full council for final consideration. “While I’m pleased that a majority of five council members agreed that Ms. McLean should continue as planning director, I’m disappointed with its vote against Mr. Wong,” Mayor Victorino said.